Posted on December 6, 2016 . 20 Comments. 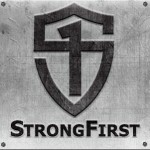 The StrongFirst approach to training is completely different from that of a typical gym rat. Most of these people are interested in the size of their muscles, rather than their function. They also aren’t as much concerned about their numbers in the main lifts, or their performance and health in general, as they are about the size of their chest and guns. And, of course, the way gym rats perform the lifts reflects their goals. While performance athletes use their bodies to perform a lift or a skill, average gym rats use movements to induce modifications in the size of their muscles and the overall appearance of their body. This means the same lift when performed by a performance athlete versus someone who is only interested in building his chest and guns will look totally different. While the general definition of muscular strength refers to the amount of force a muscle can produce with a single maximal effort, being a strong person has a much deeper meaning. Performing a gesture with maximal strength, such as a deadlift, squat, or military press, requires much more than “only” strong muscles. All of the muscles involved in a certain lift must cooperate in a coordinated and sequential manner so that in each phase of the lift some of the muscles will produce movement, others will stabilize parts of the body, and others will relax. The joints involved in the lift must also be mobile enough to avoid the compensational participation of muscles that need to stay motionless. The position of the body and all of its parts with regards to the load must ensure the best balance and leverages, and needs to be constantly adjusted during each phase of the lift. The trajectory followed by the load must be the shortest and most advantageous possible. Therefore, being a strong person involves having the right amount of mobility, having static and dynamic motor control, owning the fundamental movement patterns upon which any lift is based, having plenty of muscular strength, and, of course, owning the lifts that are performed. On top of all this, you need to know how to breathe, generate and administer tension, and much, much more. There is a lot going on in a gesture of maximal strength, and this is why in StrongFirst we say strength is a skill. If you have strong muscles, this doesn’t necessarily imply that you move well and are a strong person, but if you are a strong person, this does imply that you move well and have strong muscles. This is why, while the average gym rat trains focusing his attention on individual muscles, in StrongFirst, we practice focusing our attention on movements. This makes the real difference. But What About the Way You Look? Independent from the primary goal—whether it’s strength, speed, endurance, or flexibility—at the end of the day, everyone would like to look good wearing a bathing suit. I bet no one would be disappointed if his or her strength training program also resulted in a lean and muscular body, not to mention a symmetrical and well-proportioned one. So yes, what about muscle growth and fat loss? At StrongFirst, we see body composition and physical appearance as pleasant side effects of what we do, rather than the primary goal. They are part of the “WTH? !” effects that we achieve with our training approach. But here’s the good news. You can achieve a lean, muscular, symmetrical, well-proportioned, and aesthetically pleasing body by applying our training approach—as long as you manage some training parameters and, of course, keep up with an appropriate nutritional plan. “Grace is not the goal but a side effect of a skilled performance.”—I strongly believe that not only grace in movement, but also physical appearance is closely related to an athlete’s levels of skill and performance. “They tried to be graceful. And grace cannot be contrived. Try to hold on to it, and it will elude you.”—If you are trying to build a perfectly proportioned body by focusing only on a single muscle, one at the time, most likely you will fail. Focus on movements instead, and treat your body as a unit. If it flies right, it looks right! A powerful and functional body is likely to be a beautiful body. Through the years, I’ve strengthened my belief that it is possible to achieve a lean, muscular, symmetrical, and well-proportioned body, such as that of a competitive bodybuilder, without training like a bodybuilder. No leg extension and cable machines, no curls and other isolation movements—only big lifts such as squats, hinges, pulls, presses, etc. No focus on biceps, triceps, or calves—only on movements. My belief in this grew so strong, that I decided to prove it. Recently, I had the privilege to translate into Italian some lectures given by one of my mentors and my very good friend Geoff Neupert. I was impressed by the sentence with which he always introduced his lessons: “I would never ask you to do anything that I didn’t personally try before.” To me, this meant the best way to prove my beliefs was to personally test and assess them. So, I signed up for a bodybuilding competition. I was a competitive natural bodybuilder back in the late 1980s and early ’90s. The last time I competed in bodybuilding on a regular basis was in 1994. 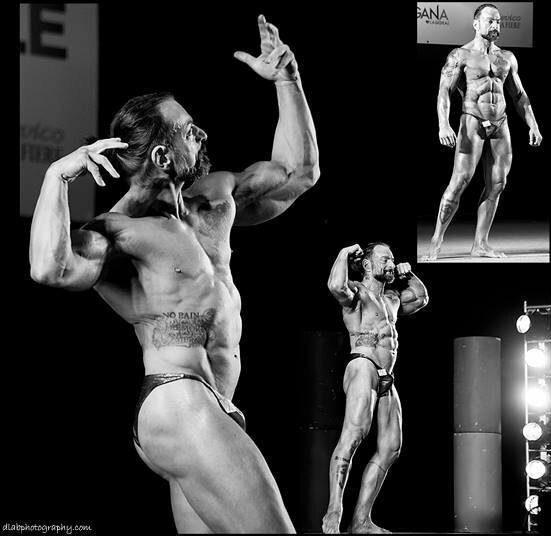 I competed one final time, in 2006, after twelve years of absence from the bodybuilding stages. I met Pavel in 2009, and I have completely revolutionized my training since then. Even though I have always been passionate about the main barbell lifts (and I have always included them in my training programs), back then I also used machines and included plenty of isolation exercises such as curls, leg extensions, and calf raises. And, of course, my focus was on muscles, rather than movements. But training for my bodybuilding competition was going to be much different this time. I would focus on movements and include in my training program only a few, selected, big lifts. There would be zero direct muscle work, not even a curl. As my good friends of BPro Physical Functional Training (they are also the licensees of StrongFirst for Brazil) design their training programs based on the fundamental movement patterns, I decided to do the same. 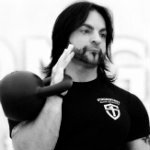 What I will describe from here on is the first program I designed with the competition in mind, and with the goal of increasing muscle mass while maintaining high levels of strength. The programs that followed and led to the competition are based on the same foundations. What made the difference in terms of fat loss and muscle definition was sticking obediently to my diet and adding some unconventional conditioning training based on the latest work by Pavel, which will be revealed directly by him at the right time. Then, I designed a program based on three different training tables, A, B, and C. Each table included four of the six selected movement patterns, each one trained first with the main exercise and then with the specialized variety exercise. I performed all the exercises in pairs, alternating one set of the first with one set of the second, and I granted at least one to two minutes of rest between each set. 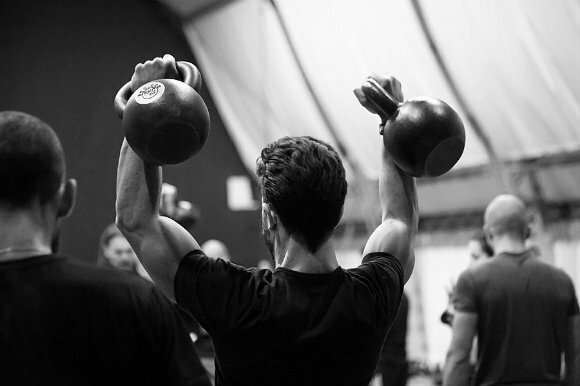 The main lifts followed a progression aimed to maintain my levels of strength and was inspired by Easy Strength. The high training volume provided by the execution of the main lifts and the specialized variety exercises combined with the high training frequency should have provided the drive for muscular hypertrophy. Also, the hormonal boost delivered by the carefully selected exercises should have played its role in this. To induce muscular hypertrophy, I didn’t rely on the typical bodybuilding methodologies such as training to failure and searching for the feeling of the “pump” and/or the “burn” by using forced reps, drop sets, etc. This would have compromised my ability to sustain the high volume and frequency of training and would also have interfered with the quality of my movement. Instead, I stayed away from failure and made sure every rep was performed with maximal technical competency. Both the weight used and the reps/sets scheme varied every training session for the same movement according to the table below. Note that the session # refers to the main lift and the related specialized variety exercise, not to the week or the table. You will do table A on Monday of week one. Table A calls for deadlift, press, squat, and bench press, plus four related specialized variety exercises of your choice. 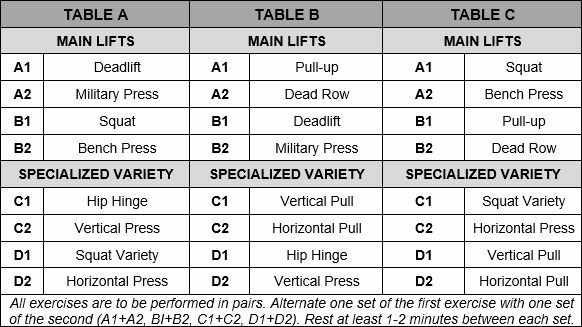 Since it’s the first time that you perform these lifts, you will follow row 1 of the table above. 5/2@70%TRM means you will do two sets of five reps at 70%1TRM in your deadlift, press, squat, and bench. 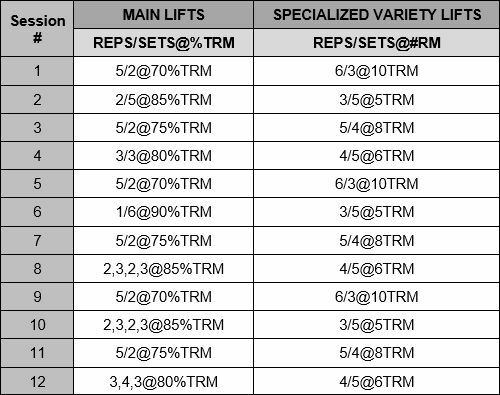 6/3@10TRM means you will do three sets of six reps at 10TRM in the chosen related specialized variety exercises. The next day you will do table B. Since it’s the second time that you perform the deadlift and the press, you will follow row 2 of the table. 2/5@85%TRM means you do five sets of two reps at 85%1TRM. 3/5@5TRM means you do five sets of three at 5RM in the chosen related specialized variety exercises. But since it’s the first time that you perform the pull-ups and the dead row, you will follow row 1 of the table above and do two sets of five reps with 70%1TRM (5/2@70%TRM) and three sets of six reps with your 10TRM (6/3@10TRM) in the chosen related specialized variety exercises. The program worked very well. I maintained my strength levels and increased my overall muscle mass, while losing fat. I started the program at the end of January 2016 at a bodyweight of 92kg and completed it on the second week of March 2016 at a bodyweight of 86kg. My ITRM remained the same (which means my relative strength actually increased) and I was more muscular. I kept training according to the same principles until the end of May 2016, and competed on June 4, 2016 at a bodyweight of 82kg and below 3% body fat (assessed with a professional fat caliper and the body composition evaluation software FitNext). I didn’t win, but I earned second place. And, according to what some of the judges told me, I was “only that much” away from taking first place. But my place didn’t really matter. What mattered to me was that I proved my beliefs on the battlefield, and I ended up on a stage with competitive bodybuilders without training like a bodybuilder. I was stronger and healthier, I could move better, and I was in the best shape of my entire career in bodybuilding. Since then, many of my students have tried the program, and some are on it right now—the results are very encouraging. If you decide to try it yourself, keep me posted on your results! I hope you’re still answering questions. Can the exercises not be done in pairs (due to training in a heavy, crowded gym). Also, I know you maintained strength while cutting, but can this program yield strength on deficit, maintenance or surplus calories? I’m curious to know how you ate. Nutrition is what I struggle with most. 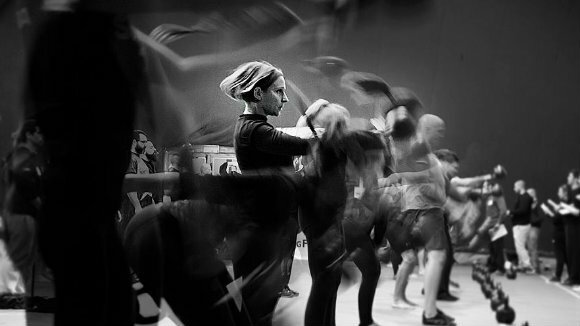 I find the training fun and love StrongFirst method and style. I love lifting heavy with both barbell and kettlebell but I am fat. I don’t find nutrition fun. How did you get lean? Is it something your average dad/desk jockey could do? Great article I just wish it included nutrition. Dylan, glad you asked—a follow-up piece centered on nutrition is coming soon! those juiced up professional bodybuilders compete at 5-6%. You look great but 9-10% seems like what you were at the time, abs but not veiny or striations. Getting below 8% as a natural lifter is just not viable. %1RM is the % of your One-Rep Max. E.g. If you can lift 200lbs for one rep with max effort, that’s your 1RM and 150lbs is 75% of your 1RM, or 75%1RM. #RM is the weight with which you can complete # reps with max effort. This looks great Fabio, I’m going to get into it and do this program, have really enjoyed your other programs. Thanks for writing this one up ! Really awesome article, Fabio! I love the way you combined the smart programming, basic movements, and specialized variety to conquer your goal and prove that simplicity and focus still reign supreme! Great plan! Thanks for sharing maestro! Awesome! From a physical therapists perspective and a functional movement guy, what a great way to achieve aesthetic results while truly getting strong and not compromising the integrity of your tendons and joints. Hope you inspire others to do the same. Very inspiring and simple results driven programming, thank you.